Microsoft (MSFT) earned top ranking (#1), followed by Accenture, Owens Corning, Intel, and Hasbro (at #5). The next five ranked companies are (#6) Altria Group, Cisco Systems, Ecolab, Johnson & Johnson, and NVIDIA Corp (at #10). The biggest gainers for the year were Becton, Dickenson; IBM; Owens Corning; and Biogen. The complete list is available in our Top Story (below). Coming up soon, CR Magazine in collaboration with the 3BL Association (formerly the Corporate Responsibility Association), presents the well known annual COMMIT!Forum conference, now re-branded as the 2018 3BL Forum by its new owners. This year’s event is at MGM National Harbor near Washington DC, October 23-25; the theme is “Brands Taking Stands – The Long View”. G&A Institute has collaborated with the 3BL Media staff and Corporate Responsibility Magazine on a long-term basis. 3BL content is carried daily on G&A’s news and opinion web-based distribution platforms. The “media” that we choose to get our news, commentary, research results, even crossword puzzles, movie reviews, the latest scientific papers and maybe information about what our friends are up to (such as “social media”) are usually self-selected. We tune in to what we want to read or watch or listen to…for information / education / entertainment…and it also helps to define us in many ways. So here at G&A Institute as we broadly monitor for content related to both our day-to-day and long-term focus areas (the list of topics and issues is long), when we see these things pop up in “not-the-usual places,” we are cheered. This weekend, for example, we picked up on the following, which were encouraging in that senior management publications are read beyond the folks involved in sustainable investing and corporate sustainability or ESG issues and topics. This is the publication of the prestigious Massachusetts Institute of Technology’s MIT Sloan School of Management. “Share Your Long-Term Thinking” was one feature article. 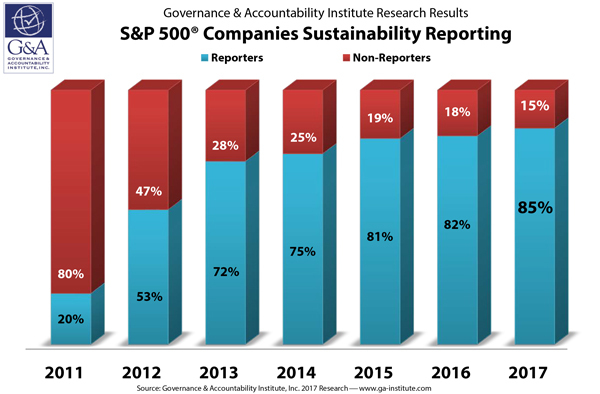 Companies need to be more forthcoming about their strategies for long-term value creation when they communicate with investors — especially about ESG issues, write authors Tim Youmans and Brian Tomlinson. Their observation is that over the past five years, CEOs have faced mounting pressure to produce short-term profits. CEOs do think about the long-term, have long-term plans (detailed and extensive) and these typically are closely held. Result: corporate strategy and practice are not captured in investor communications. They then offer six reasons why long-term plans should be disclose and how to do that. One of these is to help investors understand ESG issues through the eyes of management — because a majority of investors see ESG factors as financially material and expect sound management of material ESG factors to deliver better performance over the long-term. Tim Youmans is engagement director for Hermes Equity Ownership Services and Brian Tomlinson is research director for the Strategic Investor Initiative at CECP. That is not all for the MIT Sloan Management Review audience in the Spring 2008 issue. “Why Companies Should Report Financial Risks From Climate Change” is another feature — this from Robert Eccles and Michael Krzus. They focused on the Financial Stability Board’s Task Force on Climate-related Disclosures [recommendations]. “Investors and the rest of the world is watching to see how companies will respond to the TFCD recommendations” — the ask here is that company managements will expand their disclosure to report on the risks and opportunities inherent in climate change in such documents as the 10-k.
Boston Common Asset Management LLC and ShareAction organized a campaign with institutions representing US$1.5 trillion in AUM participating to pressure financial institutions (especially banks) to implement the recommendations. Companies should follow the recommendations, authors Eccles and Krzus argue, because this could lead to evolving better strategies to adapt to climate change — and be able to explain these strategic moves to the their investors. They focus on the oil and gas industry, looking at disclosures in 2016 by 15 of the largest industry firms listed on the NYSE. A few have made good progress in adhering to the TCFD recommendations (so there is not a “blank slate”); there is work to be done by all of the companies in enhancing their disclosures to meet the four top recommendations (in governance, strategy, risk management and metrics and targets areas). Their article is an excellent summation of the challenges and opportunities presented for such companies as BP, Chevron, ExxonMobil, Sinopec, Statoil, Total, and others in oil & gas. Bob Eccles is a well-known expert in corporate sustainability and sustainable investing and is visiting professor at Said Business School at the University of Oxford. Mike Krzus is an independent consultant and researcher and was a Fellow of G&A Institute. The magazine’s columnists had important things to say as well. Kimberly Whitler and Deborah Henretta penned “Why the Influence of Women on Boards Still Lags,” applauding the rise of the number of women on boards and offering two important criticisms — the growth rate is slowing and boards do that do have female members often limit their influence. Although there are measurable positive results of female board inclusion — they cite Return on Equity averaging 53% higher in the top quartile than in the bottom — women still are not making more rapid inroads with fewer reaching the most influential board leadership positions, even with more women on boards than 10 years ago. Kimberly Whitler is assistant professor of business adminstration at the University of Virginia’s Darden School of Business; Deborah Henretta is an independent board director on the boards of Dow Corning, Meritage Homes Corp, NiScource Inc and Staples (she was a Proctor & Gamble executive). The content we outlined here is powerful stuff (our own technical term) to crank into corporate strategy-setting, and savvy execs are doing just that, as we see here at G&A as we pour through the more than 1,500 corporate reports we analyze each year with titles such as Corporate Sustainability, Corporate Responsibility, Corporate Citizenship, Corporate Environmental Sustainability, and more. And so it is very encouraging when we wander beyond the beaten path of reading the reliable staple of sustainability-oriented and CSR-oriented media to see what the senior management thought leadership media are doing! The October 2017 Event Will Convene in Washington DC’s Maryland suburbs — New Venue is the fabulous MGM National Harbor. The annual COMMIT!Forum has set the pace for Corporate Responsibility / Sustainability / Public Affairs / Corporate Communications professionals and their peers as “the place to gather” for a decade and more. This is the longest running CSR / CR event and is part of the range of activities that were put in place and managed by the SharedXpertise Media LLC organization. In April 2017, 3BL Media Group acquired the COMMIT!Forum — along with management of membership group, the Corporate Responsibility Association (CRA); the CRA webinar series; and publication of the influential CR Magazine. You probably know the widely-recognized “100 Best Corporate Citizens” rankings — senior corporate management actively pursues this important CR Magazine recognition. The professional membership CRA will now be managed by a unit of 3BL, the Corporate Responsibility Board. Brands Taking Stands – the Role of the Corporate Responsibility Practitioner as Companies Make Their Voices Heard. The annual conference brings together CR practitioners, corporate communications officers, heads of foundations, not-for-profit leaders, sustainability pros, and media representatives. Finalists for the coveted Responsible CEO Award will participate in panel discussions and one-to-one interviews; these provide valuable insight into successful programs at companies where “purpose is integral to culture and mission,” conference organizers note. The COMMIT! meetings have traditionally been held in New York City; this year the event moves to the MGM National Harbor, just outside of Washington DC and convenient for Amtrak travelers all along the Washington-NYC-Philadelphia-Boston business corridor. Prestigious brands: CRA member flagship companies include: Marriott; Visa; IBM; Adobe; AT&T; Hess; Sprint; PwC; Gap; Intel; Johnson Controls; Aramark; Smithfield; and many more — representatives of these companies will be at the COMMIT!Forum. G&A Institute team has enjoyed a long-time partnership with 3BL Media The going back to the days of both companies’ founding and has long been a sponsor of the COMMIT!Forum meetings. G&A Institute team members — including EVP and Co-Founder Lou Coppola – will be active participants at COMMIT!Forum. We are offering today to our connections a special offer for Early Bird registration: 10% off early bird pricing for COMMIT!Forum (extends through August 15th for you). The G&A Institute team looks forward to seeing you at the conference – -the latch key is out! The 3BL team provides a multi-channel news and content distribution platform for corporate clients, including Report Alert, Triple Pundit, CSR Wire, SocialEarth, Just Means, and, of course, 3BL Sustainability Communications platform. A new business unit is the Corporate Responsibility Board LLC, housing COMMIT!Forum, the CR Association, and CR Magazine. 3BL’s Dave Armon is CEO (before joining 3BL he was COO of PR Newswire).